It was a fun weekend at Tally Classic, despite the favorites winning in both divisions. There were a few major story lines to emerge in each division, so let’s get right into it. Clemson‘s swarming zone defense overwhelmed their opponents at Tally Classic, and their veteran-laden roster was far more ruthless with break opportunities than any other team in the field. Their superior athleticism and offensive chemistry were too much for teams as they blew out every opponent they played. The Tiger Lillies’ closest game was their 13-5 opening round game against Kennesaw State, and they outscored their opponents by a combined score of 81-22. They scored the maximum amount of points (13 on Saturday, 15 on Sunday) in five of their six games. For comparison’s sake, the rest of the Tier 1 teams at the tournament combined to do that just eight times. Clemson was the best team at Tally, and it wasn’t close. Being able to work together on a zone for so many years is certainly helpful, and that time together showed on the offensive end, too. Players like Elena Miyasato and Emma Ressler were both instrumental in the red zone, where many of Clemson’s possessions started thanks to their suffocating zone. They were almost as efficient on offense as they were oppressive on defense, and that was more than enough win Tally Classic. The field wasn’t especially strong, but the way they dominated every team the played still deserves notice. While no team was on Clemson’s level, Harvard and Notre Dame formed a solid second tier at the tournament. Both teams looked like they could potentially be in the running for making a game to go at regionals. Harvard made the final with just one loss, a 12-10 to Florida at the end of pool play. They grabbed a couple of close wins over Notre Dame along the way, and blew out South Florida, Tulane, and Illinois. Audrey Sheehy was a goal scoring machine, while Andrea Brown was a solid quarterback in the team’s backfield. Karen Reyes and Michigan grad transfer Amy Stoddard were impressive as all-around playmakers. Harvard also employed a zone defense that was effective against most offenses. They weren’t as aggressive with it as Clemson was, but they did a nice job of staying at home, forcing a lot of throws, and waiting for the turnovers to come to them. “We saw Florida and Clemson both at Queen City, so a month or so ago, so it was a great opportunity to kind of have that bench mark to see where we’ve grown and still have the areas the we need to grow going into the rest of the season,” said Sinicrope. Hoffmann identified the team’s zone offense as one area that showed marked improvement, but that the game against Clemson highlighted the areas where they can still improve in that regard. Notre Dame, meanwhile, suffered just two losses, both to Harvard, by a combined three goals. It was a nice bounceback weekend for Notre Dame after going 1-6 at Queen City Tune Up. In particular, their two wins over Florida, and their 12-11 double game point win over Florida State in quarterfinals demonstrated the club’s improvement. Katarin Jamsek was one of the most impressive players of the weekend, and when she and Colleen Scott were clicking in the Notre Dame backfield is when the team was at its best. Notre Dame isn’t very deep, with just 18 players on the roster, but they are a gritty bunch, and their top players like Jamsek, Scott, and cutter TC Burrows were prepared to play a lot of points. It wasn’t quite enough for them to make their fourth straight Tally Classic final, but they did show signs that they could be in contention for the lone Nationals bid out of the Great Lakes. Florida‘s Tally Classic, much like their season, had its ups and downs. After starting their tournament by being upset by Notre Dame, they bounced back to win their pool by beating South Florida and Harvard. But they then lost their Saturday crossover game to Florida State on double game point. They claimed a comfortable quarterfinal win over Kennesaw State, but then were shut out by Clemson in the second half of their 14-3 semifinal defeat, and they concluded their tournament with an 11-8 loss to Notre Dame in the third place game. Florida was missing some players, and lost a couple to injury over the course of the tournament, and that certainly didn’t help. But the team struggled to find a consistent groove offensively. Gabby Krajniak took up a lot of the touches in the backfield, and at times she was forced to make some questionable throws, as her cutters struggled to find a comfort and cohesiveness in their roles, especially against zone defenses. There’s still a way to go for Florida as they continue work in their plethora of new players, most of whom got a lot of playing time on the weekend. Florida’s regular season is now over, with Conferences their next tournament on the schedule. It’s still shaping up to be a wide open battle for the one Southeast autobid, and despite the up and down results, there are no signs of panic from the team’s leadership. That’s probably a good sign for the team that’s taken the region’s lone bid each of the last two seasons. #8 Central Florida proved themselves as the team to beat in the Southeast at Tally Classic. After a winning their pool, they rattled off three straight 15-10 wins over regional foes Alabama, Florida State, and Auburn in quarters, semis, and the final, respectively. The final was a matchup of the two most impressive teams of the weekend, UCF and Auburn, who’d gone undefeated on the weekend to that point. It was actually Auburn who won the opening stage of the game, getting the first two breaks of the game at 3-2 and 5-4 to take a 6-4 lead. But as soon as they went down two goals, UCF flipped a switch and ramped up the offensive efficiency. They went on a 4-1 run to get back on serve and take half, 8-7. The second half was the Adam Vinson show. He tore Auburn’s defense apart with his speed, scoring multiple times on strike cuts to the front cone, despite everyone knowing it was coming. Auburn simply didn’t have anyone that could hang with him. After a couple of breaks to start the second half pushed their lead to 10-7, UCF’s offense was able to maintain the lead for the rest of the half, thanks in large part to Vinson’s unstoppable play. They then got two late breaks to close it 15-10 out as Auburn got a little sloppy. The final win earned UCF their first tournament win since Carolina Kickoff in 2015. It was an impressive Sunday performance from UCF, winning the final and semifinal over Florida State as comfortably as they did. They proved their loss to Notre Dame the day prior was merely a fluke. That quote sums up pretty well how UCF is playing this year. They’re clearly enjoying playing together, visibly more so than they have they last couple of seasons, and they play with absolutely no lack of confidence. They suffered a blip at Tally Classic in their loss to Notre Dame, but they showed who they really are with their streak of 15-10 wins on their way to the tournament title. And what they are is the best team in the Southeast, at least through this point in the season. The final didn’t go the way Auburn had hoped, but they were able to maintain their status as the Southeast’s number two team and, more importantly, hold onto a second bid for the region. That they did all that while missing some key players make it all the more impressive. Luke and Sam Smith were both absent all weekend, Michael Strobel didn’t make it to the tournament until Sunday morning, one of the team’s captains Mark Shannon missed time, and Harrison Lott broke his foot at the tournament. The team’s struggles against UCF could largely be chalked up to their depth limitations, as they began to make tired mistakes that allowed UCF to retake the lead and then pull away. “They started to bracket all of our set plays, and…we got a little stagnant. I think we were probably a little gassed in the second half. We just started to feel the weekend a little bit,” said team captain Rocco Magnella. Eric Sjostrom also didn’t have his best weekend as a thrower, though he did prove to be a tough matchup for teams downfield, where he spent a lot of his time on Sunday. But Magnella had an impressive tournament in the team’s backfield, and freshman David Perry looked like he may have sewn up Southeast Freshman of the Year honors. So there were plenty of positives for Auburn, despite not being able to field their most competitive team, and others not playing their best. Auburn, now sitting at 18th in the USAU rankings, and holding onto the final strength bid, will have to perform well at Easterns if they are going to bring a second bid to Regionals. But based on how they performed this weekend without the players they were missing, they should be in a fine spot once they’re all back. Coming into the weekend, there were a lot of eyes waiting to see how Alabama would play. They had jumped into a strength bid the previous weekend, but they fell well off of it with their this weekend’s performance. Right out of the gate, they dropped a game to Cincinnati that essentially ended their chances of earning a bid right then and there. Alabama ended up 2-4, with a close win losses to UCF, Tulane, and Harvard all dragging down their ranking. The Southeast is now down to two bids, and Georgia will need a big weekend at Easterns at the end of the month if they’re going to get it back to three. One team that will be sad to see the third bid leave the region is Florida State, who went undefeated on the weekend apart from their losses to the two current bid holders, Auburn and UCF. Florida State again showed flashes of being a team capable of stealing a bid come Regionals, but struggled for consistency against those two top end opponents. Their handlers, in particular, lacked the clean play needed against the teams with the most efficient D-line offenses. Alabama-Huntsville also looked like a team that could be a pesky opponent come Regionals; they gave tough games to both UCF and Auburn, and they ended up finishing fourth. They were long and athletic, and played without fear against the region’s favorites. Southeast Regionals are always a gauntlet, and UAH looks like they could be a part of that this season, even if they have very slim chances of making out of the region themselves. 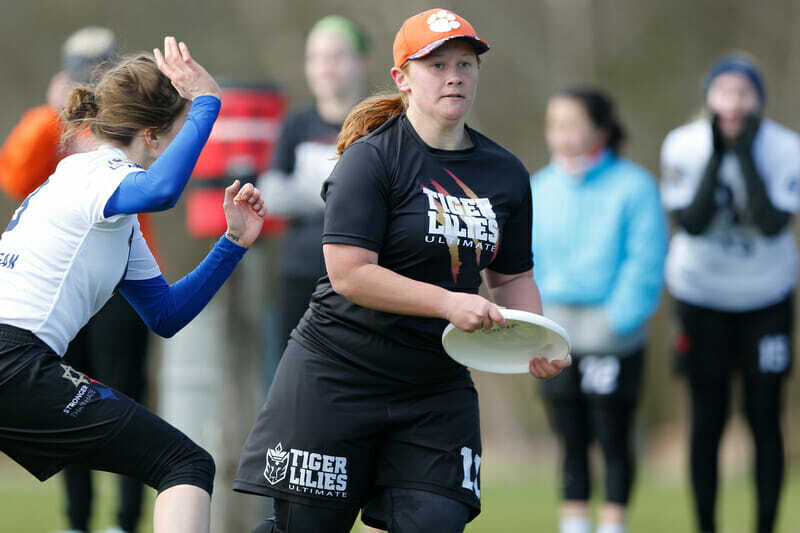 Comments on "Tally Classic 2019: Tournament Recap (Men’s and Women’s)"